Just check out these discounts! You can e-mail us at sales@AmericanCeramics.com if you need any help with technical support, best stools and/or specific shipping needs. stool on the way to you! The ST1 has a wide, adjustable back rest and air cylinder with an adjustable seat that adjusts from 18 to 23". 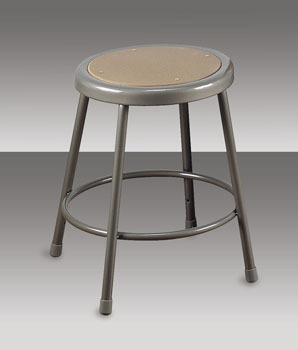 Swivel motion adds to the versatility of this stool. The seat tilts to adjust to your desired throwing position. Supported by a five leg base with easy glides on the feet for stability. The ST1 comes in camel (beige) and features durable leather-like upholstery. 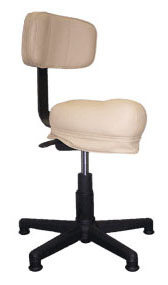 ST4 Stool, Rugged and contoured seat provides lower back seat support. Made from molded plastic and a firm cushion, durable in the most severe-use conditions. Easy to clean. Air cylinder finger touch height adjustment extents from 16"-23". Five leg base with glides for stability. 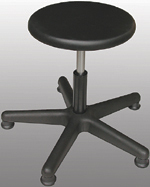 ST5 Stool, Has thin, firm, durable cushion. Manual adjust spindle, 5 leg base for stability. 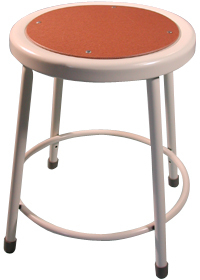 ST10 Stool, Basic 4 leg steel stool, 18" tall with wooden seat. The adjustable leg version allows an assortment of heights to accommodate everyone, and can be tilted to relieve the strain on your lower back. The tilt feature also puts you over your work. The stool is done attractively with a white frame and blue seat. The adjustable leg model not only serves the potter but will also comfortably fill the needs of the painter and sculptor. This potter's stool combines fine quality workmanship and comfort-oriented design. It is 18" high, making it perfect for use with most wheels. Unitized welding assures strength in the one-piece gray tubular steel frame. The seat is 14" in diameter and is made of heavy-gauge cold-rolled steel with curled edges to reinforce the seat and eliminate safety hazards. A 1/8" thick tempered hardboard seat is recessed into the frame. All prices are subject to change without notice due to manufacturer's price increases and fuel surcharges with shipping companies. We reserve the right to adjust pricing accordingly. Please check with us prior to billing to be sure you have correct pricing. American Ceramic Supply Company, Inc.